Cane floats in flooded area of camp, tent buildings and forest trees in background. 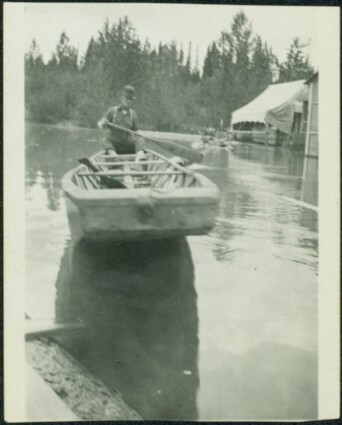 It is believed that this photograph may depict the Island Cache in flood, at Prince George, BC. Item is part of the Taylor-Baxter Family Photograph Collection. See also items 2009.5.3.90 - 2009.5.1.98 for similar content. Stamped annotation on recto of photograph: "[15? ]".